The lovely package you see above arrived all the way from New York recently. 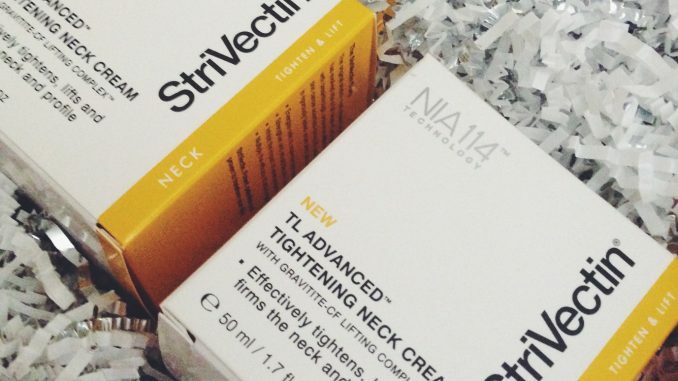 It came from skincare specialists StriVectin who had heard that, like Nora Ephron , I often feel bad about my neck. As skin saviours they were coming over the ocean to help. So my neck doesn’t exactly have wrinkles but it is definitely collapsing in a way that it didn’t 5 years ago. It has a habit of developing weird folds depending on how I’ve slept. Until the options open up to move to a gravity-free environment, I think I have to live with the fact that everything’s heading south. So what can StriVectin do to help? StriVectin was originally a company who made stretch mark cream, until it turned out that their customers were getting great results using the cream on their faces too. They now produce a range of upmarket anti-aging skincare, under the company’s motto ‘Bold science. No nonsense results. That’s smart beauty for smart women.’ which I REALLY like. The packaging is no-nonsense and almost minimalist, I guess to reflect the products’ science lab origins and 35 years of research. In the UK you can find it in selected outlets including SpaceNK , FeelUnique and Selfridges. I’ve also seen the odd StriVectin product crop up in my local TK Maxx. StriVectin TL Advanced™ Tightening Neck Cream features breakthrough Gravitite-CF Lifting Complex™ to provide visible lift in the neck and profile area- immediately and over time. Gravitite-CF Lifting Complex™ contains a powerful blend of technologically advanced ingredients that address the appearance of sagging due to gravity and improve skin elasticity. Instantly, skin is hydrated and feels tighter, smoother and more supple. Over time, the visible effects of gravity appear reversed for even more refined and toned definition of the neck line, profile, and décolleté. 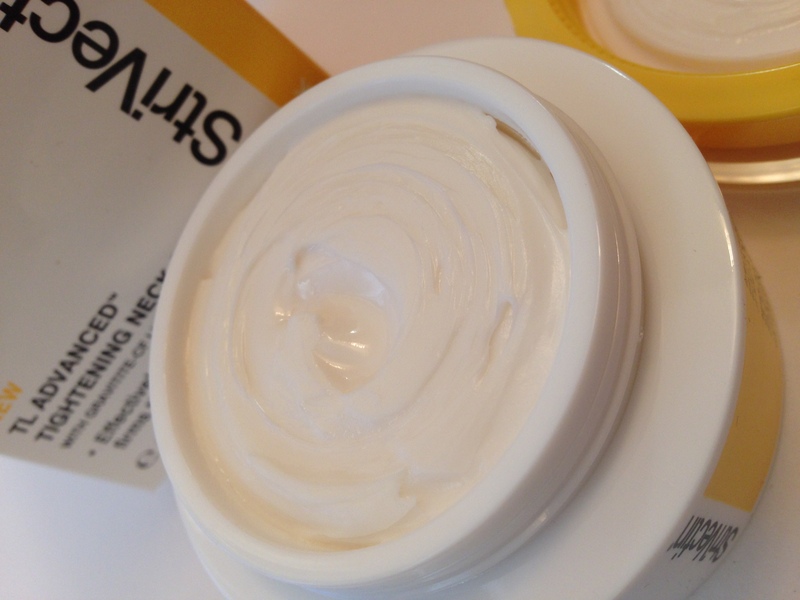 I’ve been using the StriVectin neck cream for a couple of weeks now and I have to admit that initially I was sceptical. I mean, your neck is just skin, right? The same as skin anywhere else on your body? The only difference is that it’s easy to miss when applying skincare and sun cream to the rest of your face, and this in itself is enough to ensure that your neck ages faster than the rest of you. So whatever you’re putting on your face (especially sun protection) get in the habit of putting it on your neck (and the backs of your hands) too. 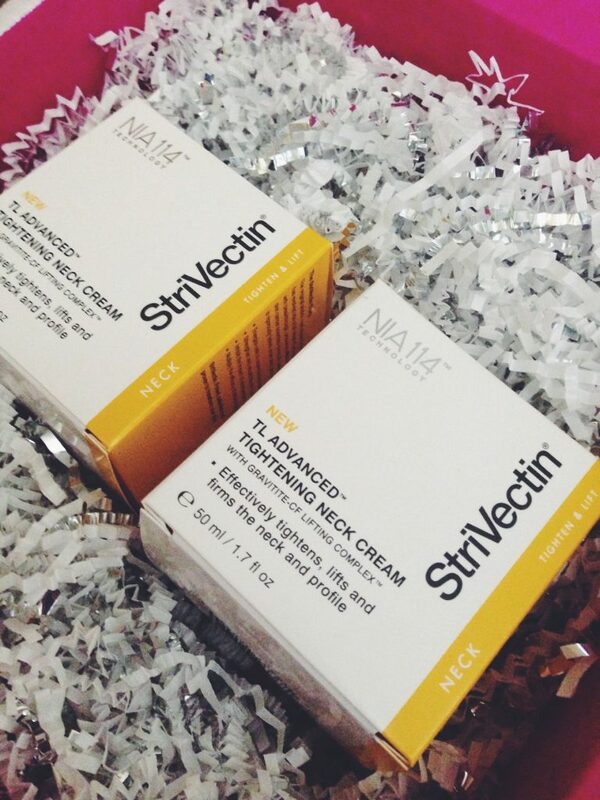 The StriVectin neck cream has an intriguing, exclusive ingredient called NIA-114, plus a blend of antioxidants, plant extracts, shea butter, hyaluronic acid and all sorts of exciting sounding stuff. The cream itself is thick, white and buttery, blending in to the skin as soon as it’s applied. Despite my initial hesitancy, I have to admit that my neck looks better now than it did before I used the StriVectin cream. It’s undoubtedly smoother than before I started using it. And when I looked online, many happy StriVectin customers seem to agree, with many hailing it as a wonder product. 1 winner will receive a brand new 50ml jar of StriVectin TL Advanced Tightening Neck Cream, which retails in the USA for $95. I can’t find the exact same cream on sale in the UK, but there is a very similar looking StriVectin Tightening Face & Neck Cream which retails in the UK for £83. So this is a pretty exclusive, luxury treat for the winner. Closing at midnight on Sunday 22nd November 2015. 1 winner will be chosen at random and the prize sent out as soon as possible after that.